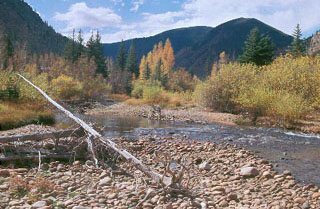 Description: The Clear Creek Ranch contains 1/2 mile of the 30 foot wide Clear Creek, which can usually be fished year-round. It has been well managed by the owners and contains good populations of rainbows and browns averaging 10-14 inches, with a few rainbows approaching 20 inches. Location: The property is located about 2 miles east of Georgetown, just 45 minutes from Denver. Capacity: Limited to 2 anglers. Up to 4 anglers permitted if in one group.